Linda Rhinehart Neas self published her first written work at the age of seven on the cardboard she gathered from her Dad's shirts after they came back from the laundry. Since then, she has written extensively in various venues. Her work has been published and performed throughout New England. Gaining inspiration from her four daughters and three granddaughters, she has calculated that she will run dry of ideas for writing sometime in the next millennium. Her first full collection of poems, Winter of the Soul, was published in 2008. Next to writing, teaching is her second passion. 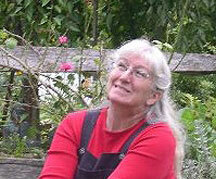 Presently, she is working on her second book of poetry, essays and memoirs on teaching and two children’s books. Linda lives in an enchanted cottage surrounded by trees, bushes and perennials which she and her beloved, Roger, planted. Their dog Molly keeps track of all the other critters who call the enchanted cottage home. Linda won 3rd Place in the Fall Personal Essay Contest sponsored by skirt! books, with a prompt by Jill Butler, for her story Enchanted Cottage. If you haven't done so already, read her story and come back for the interview! WOW: Welcome, Linda, to The Muffin, and congratulations on winning 3rd place in the Fall Essay Contest. What was your favorite part of writing this essay? Linda: My favorite part was the challenge to include the quote into the story. Interestingly, it was not difficult to do this…it just seemed to fall into being. I was in the middle of writing the essay and suddenly there was the place for the quote. It made me very happy. WOW: That's great when things fall into place. I love how you incorporated the quote with something Momma might have said. She sounds like quite the inspiration! Did she have favorite poets that influenced you in becoming a poet yourself? Linda: Yes! She loved all types of poetry, reading everything to me from Robert Frost to Rumi to Edna St. Vincent Millay to Emily Dickinson. She never thought about whether something was too mature for me or if it was "appropriate" as they say today. If she found something in a poem that resonated with her, she shared it with me. One of our favorite poems was Robert Service's "The Cremation of Sam McGee." It is a story poem of how a gold miner helps fulfill his dying friend's last request for cremation. For whatever reason, I thought it was the funniest thing I had ever heard…perhaps it was the way my mother delivered it, or maybe it was simply the funny pictures it created in my mind. I fell in love with Dickinson and Frost the first time I heard their work. The sound of the poems, the rhythm of the verses touched something within me. I wrote my first poem at the tender age of 10. The local librarian liked it so much; she submitted it to the Horn Book Club for a contest. At that moment, in spite The Horn Book Club not publishing the poem, I knew I was a poet. WOW: Congratulations on publishing your first full collection of poems in Winter of the Soul. Please tell us a little more about it! Linda: Winter of the Soul is a semi-biographical journey through the various phases of love and life. It is a collection of poems written over the past thirty years. I was inspired to put it together after giving spontaneous readings to friends who liked my writing. They kept asking about when I was going to publish my work. My Mom was failing in health and I wanted to be able to honor her and my Dad with a book of poems, evidence that their daughter was a true poet. I am not sure how much of it she was able to read, but she had a copy which she kept by her bed. I know it made her very proud. WOW: What a wonderful gift to her. We understand you are working on another collection of poetry in addition to more essays and children's book. When you sit down to write, how do you decided which project to focus on at that particular time? Linda: Good question! It sometimes depends on inspiration and sometimes depends on timelines. The children's books I have been working on for over a year. The idea for both of them came within days of each other. Rather than lose the ideas for them, I started writing outlines immediately. The text for one is almost complete. The other book needs more research done before I can actually start writing it. I add to the poetry/essay book weekly. Writing is my passion. I am creating something every day, whether it is articles for my church newsletter or emails to my four daughters, I am constantly writing. As soon as I complete one project, I begin another. I cannot imagine a day without writing. WOW: That's fantastic that you write every day--you must have a great space to write in. If someone asked you how to create a personal space that would really inspire them, where would you tell them to begin? Linda: First, it is important to have a space that is their own, where they can be alone, if they so choose. Some place where they can safely keep the tools they need to create ready for them to use as well as their work. Then, if possible, they should have a view outside. Nature is so inspirational, so healing. Finally, for further inspiration, they should include pictures of their loved ones, or photos of beautiful places, which they feel a connection to and a shelf for books, which bring them to a place that reminds them of why they love to write. John McPhee, Steven King, and Anne Lamont all have written that in order to write well, one must read extensively. Having your favorite books within arm’s reach is so important, I think. WOW: Do you have any writing rituals? Linda: Hmmm. This is the first time I have ever had anyone ask me this. Yes, I do. When I sit down at my little desk wedged into the western corner of my home, I look out into my mediation garden. I mediate on the prayer flags moving gently in the breeze, notice which birds are visiting the feeder, and listen to the many wind chimes hanging in strategic places, each with its own harmonizing tone. After a few minutes, I begin to type out whatever I feel inspired to write. If I come to a place where I feel stuck, I stop and mediate, looking out the window. Almost always, the muse whispers in my ear and I am off again into the poem, story, or essay I am working on. It's magic! WOW: That sounds peaceful. Lastly, do you have any advice for those just getting started in their own writing adventures? Linda: Write, daily! The more you practice your craft, the better it becomes. Keep a journal, a diary, a blog, whatever works for that particular writer. Do not give up. Keep writing even if editors do not publish your work, even if you get the worst critique imaginable. Learn to take constructive criticism; do not take other criticism personally. Rejection does not mean you are not a good writer. It simply means that that particular venue did not publish your work. Find someone you trust…someone who can impartially look at your work and give you good feedback. Above all, believe in yourself and listen to your heart, muse, guides or whatever form your inspiration takes. Finally, write, read, and write some more. WOW: Thank you Linda for taking the time to chat with us today! Your tips are certainly inspiring. Find out more about Linda by visiting her blog, http://contemplativeed.blogspot.com/ and her website, http://holisticwritings.com/.